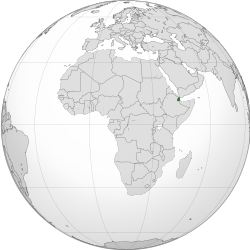 Djibouti (Arabic: جيبوتي ‎ Jībūtī), offeecially the Republic o Djibouti, is a kintra in the Horn o Africae. It is bordered bi Eritrea in the north, Ethiopie in the wast an sooth, an Somalie in the sootheast. The remainder o the border is formed bi the Red Sea an the Gulf o Aden. Djibouti, wi 865,000 citizens (2009), is ane o the least populous kintras in Africae. The predominant releegion in Djibouti, wi a 94% majority, is Muslim, wi the remainin sax percent claimin Christianity. In the 1800s, Djibouti, then French Somaliland, wis acquired bi Fraunce through various treaties wi Somali sultans. It wis declared an independent naition in 1977, an chynged its name tae the present day Republic o Djibouti. Djibouti joined the Unitit Nations on September 20, 1977. While Djibouti is an independent state, it maintains deep French relations, an through various military an economic agreements wi Fraunce, it receives continued security an economic assistance. ↑ 1.0 1.1 1.2 1.3 1.4 "Djibouti". The World Factbook. CIA. 5 February 2013. Retrieved 26 February 2013. ↑ 2.0 2.1 2.2 2.3 "Djibouti". International Monetary Fund. Wikimedia Commons haes media relatit tae Djibouti. This page wis last eeditit on 30 August 2018, at 12:46.